Sunday is usually a day or rest and for once us showman were to enjoy a comparatively restful day. Our Dolly was parked safely in the Underbank Rugby Club and we had been asked to wait until 11.30 am to collect her. 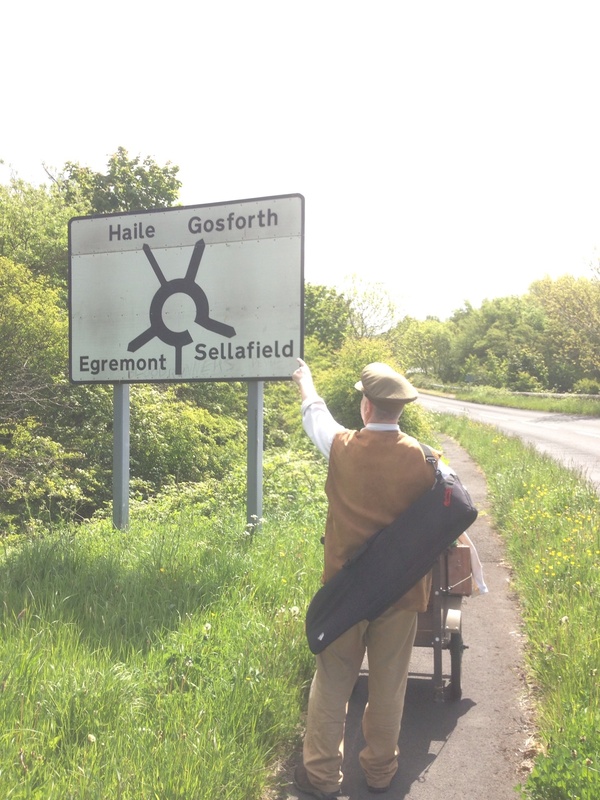 Also we had already conquered the final hill of our Holmfirth adventure so as the saying goes it was all down hill from here and our final performance at The Bridge Hotel that evening would close the curtain on one the finest of vagabonding weeks. Steve sorted us our with a Sunday fry up and a lift back up to the club and we agreed that we would all catch up with he and Lesley before we set off for home. We arrived promptly and shunted us Dolly down hill for once into the bright lights of Holmfirth. The road was quite busy and we spent most of the journey in our own company void of many passers by other than fast cars. We spent our time talking about our next journey around lancashire and how we hope to vagabond together again next year. We arrived and set up for the final performance. Our show went very well and once more our applause lingered. We are proud of our production and look forward to performing it for fresh audiences in Lancashire this August. We were both tired at the end of the show and we packed away and listed the props, costumes and instruments. We slipped briefly into the last night party gig and mamboed a goodbye to our promotors and the organisers of Holmfirth festival. Whilst thanking people I do have a list. We are most grateful to Blaize who have produced this years vagabond show and look forward to plotting and planning next years shunts. Ellen Thorpe and Paula Horton work tirelesly backstage for Blaize researching and and applying for the money that makes the art happen and along with our own Janice Benson share every round of applause we receive out on the road. We need to thank Shaun (Blez) Blezard for all his assistance with technology and for his amazing photos that have and will help us promote our show in the future. Also to The Ashton Group in Barrow who very kindly gave us space to rehearse our show free of charge affording us more budget towards our design. Jim Woodland who has both written some of the material and directed our show also shares our applause. Thanks Jim. I enjoyed it very much. Holmfirth Festival and Arts Out West our promotors for the last few weeks of vagabonding along with Spot On Lancashire who we look forward to joining in August for more of the same. Good old Dolly and of course our partner and friend the grand master showman Maxim. A fine gig and joyous experience. Thank You! Dolly and me are about to embark on other adventures so please check my own website for the gig list. We will see you all in August when we Ramble On some more. I received a tweet from Maxim that Lesley was cooking eggs. I had quite a restless night and despite a few pints found it difficult to get off to kip. This was simply because I was still buzzing from our show in Hepworth. I lay awake assessing what had gone well and how we might tweak the show to make it better. We have settled into the show and can afford to play with it now that it fits us like comfortable slippers. 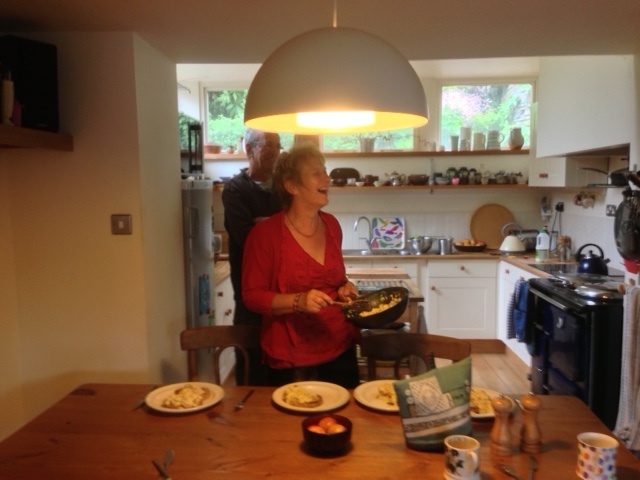 We had bacon and scrambles eggs with crunchy toast, butter and tea. I am a convert to good bread. Thanks Lesley and Steve for having us. Amazing people. After breakfast we took a stroll into town to buy a bunch of daffs for Lesley and Steve our hosts, I also had a sudden lust for a Marathon bar. Through a gap in the buildings and up a small rise to a park we could see brightly coloured flags and the tip of a big top. We took a turn and made our way up the steep steps to see what all the fuss was about. There stood Tacko in his bright red ringmasters costume, proudly barking in front of his Imaginarium. Shortly we were lodged inside a full house as the overture played on his gramophone. Soon enough we were treated to the flea circus and watched in awe as his company of fleas gave their performance. Herkufleas pulling a giant chariot around the central ring, Madam Flea Flea swinging on her trapeze and the death defying Evil Ca Fleavel being shot from his cannon. Let me know when you want your fleas back!!! I left with two bites of my very own. One small lump on my right arm and another on the side of my left wrist. Some of the cast were obviously playing truant from Tacko’s sharp moustache. I recognised the swelling as I have been bitten by Tacko’s Fleas many times before in countless tents, booths and dressing rooms. I also bumped into an old friend Nadgam who is a fine tabla player from Bradford. He was dressed as a Mexican. After the show we picked up a bunch of flowers and left them in the sink as a thank you for Lesley and Steve. Steve is also a fellow showman and was off to perform at another festival with his band The Northern Lights. As such we were a bit stuck for a lift to Hepworth to collect us Dolly. We decided the best thing would be to jump a taxi. We walked back into town and asked a bloke where we might find the rank? 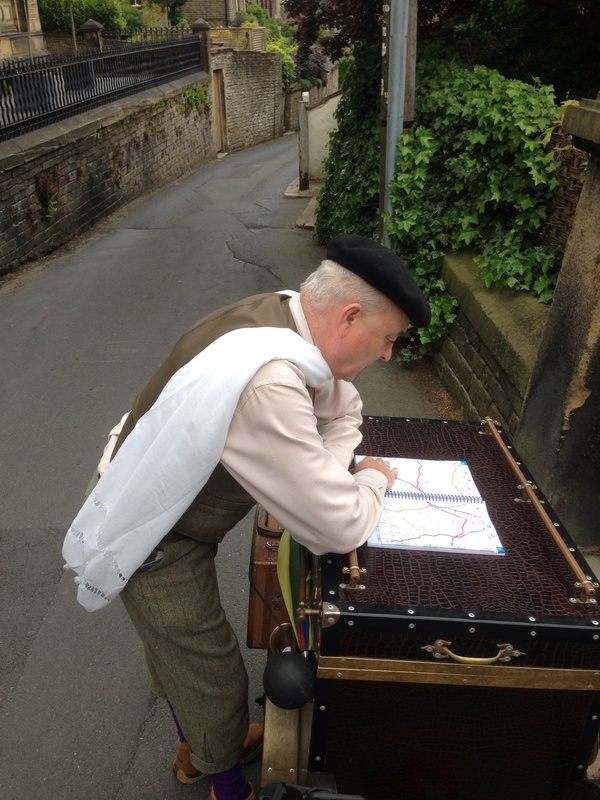 Colin is the bloke who runs the Last Of The Summer Wine Charabanc, driving visitors and fans around the valley showing the famous locations from the program. He invited us aboard and agreed to drop us at Hepworth as it was a part of the tour. We were to jump off at the top of the very hill that we had sweated so much to climb the previous day. We learned many things about the show along the way and as we approached we were informed that this was indeed the hill where many of the stunt routines were filmed, Compo would often be found shooting down this hill in a tin bath or similar misguided mode of transport. The steep gradient lent itself very well to comedy as we well knew. A bus was stuck at the top blocking the road ahead. Somehow the driver had managed to skew-whiff his double decker blocking the road to all traffic including Colin, us and his passengers. You’ll best leap out ear lads. Can’t turn is thing around! We left skirted the bus and managed to make it to the village hall to be reunited with Dolly just fifteen minuets late. Problem was we now had to push back down for a gig in Underbank. The journey to Underbank was of course back the way we had came so we had another opportunity for a work out down and Upppppppp the roller-coaster to Scholes. We also needed a bus pass. We didn’t fit between the bus and the small stone wall to the left. It all got a bit Barnard Cribbins. Firstly off came the side pannier boxes that hold the tool kit and one of our roadside routines. Right then we will have to lift her over the wall. So Maxim myself and driver managed to 1.2.3 Liffft our theatre over the stone wall leaving just the faintest scrape down the side of the bus. None shall pass. but we did. The remainder of journey was relatively simple. Even the push back up the mighty hill passed quickly. We rested at the top and enjoyed watching a few overs at the local cricket pitch. Scholes V Sheldon. We heard later Scholes lost badly. We did however have the faintest pat of rain and sheltered under a tree watching the local rush hour. 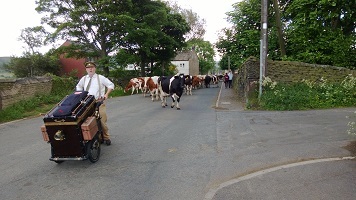 A local farmer herding his dairy flock. We arrived a full hour before our expected time and rested up. 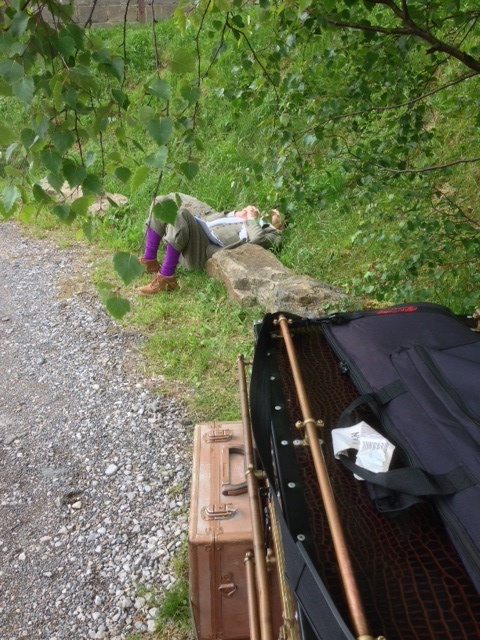 Maxim had a nap under a tree as I kicked my heels up and down the local roads trying to find a cafe or pub. I also received a toot from Colin and his punters who was obviously finding alternative routes for his tour. Maxim this is your three hour call. Stand by please. We set up for our show in the Underbank Rangers Rugby Club. An hour before the show Lesley arrives with Steve and a stunning curry for us tea. Having scoffed our audience arrive and we show for the penultimate time. Once again our show is well received and at the end an audience member asks how long we have been doing the show. This is show number eight. Eight? Looks like you have been doing it for years! 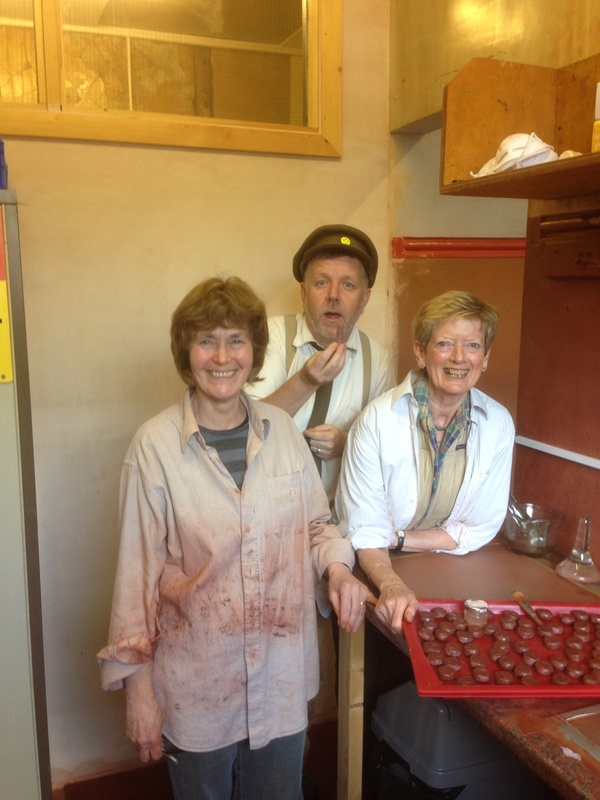 Later in Holmfirth we meet up with Tacko and his team fresh from their own day of showing. In another life I perform with a band of white face clowns Smiley Smacko our guitarist and Uke player has arrived so for the first time in ages half of the band are in the same room. Smacko, Tacko and Gacko. Maxim and me have a malt raise a glass and slide home to rest up before the mornings descent. Happy Solstice and Happy Birthday Ah Mam. Sat once more around the breakfast table with Lesley and Steve, Maxim and I buried our heads in lap tops and iPads to blog our previous days adventures. I apologised profusely, explaining that the written accounts of our tramp are every bit as important as the wandering, waving and walking onto stage and how it is important to try and get them done whilst fresh in the memory and before our next performance. I also had a few important calls to make. One to Ah Mam on the occasion of her birthday and another to Tacko my old street theatre partner who was himself soon to join us at Holmfirth Festival with his fabulous flea circus. Him In time for the show! But that shall be another story. 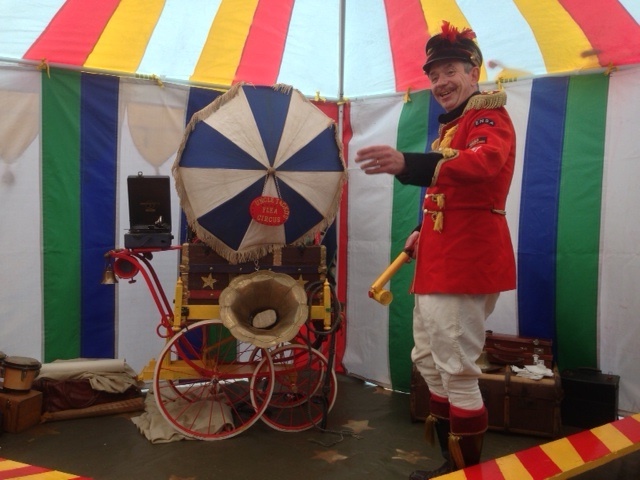 Keep a look our for Uncle Tacko’s Flea Circus at Holmfirth Festival or Hebden Bridge later this weekend. Steve has a camper van and he swings it around the tight little roads of Holmfirth with the greatest of ease! 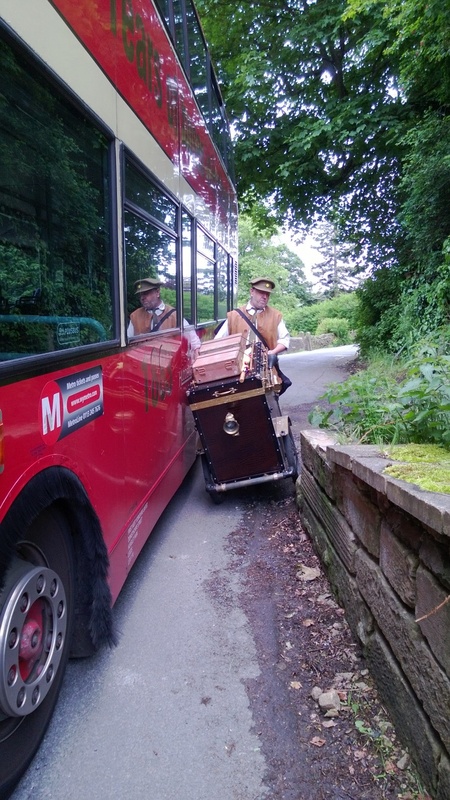 He very kindly whisked us back to Wooldale to collect us Dolly for the shunt onwards to Hepworth. The beginning of the walk was brief and only a few strides in Maxim was delivering a routine to a group of school children at the invitation of their teacher. The sun shone again lighting his performance as audience sat crossed legged on a carpet in the playground. later we pushed on through the village. Curious stone buildings jutted out at all angles along the narrow twisting roads. I once again reflected on how these buckled little buildings somehow belong to the landscape. My own county of Cumbria is breathtakingly beautiful, it is of course Great Britain’s garden, yet Yorkshire suits us vagabonds better in some ways. During our Cumbrian walks we enjoyed mile after mile of green and pleasant land often without seeing a single person or car. 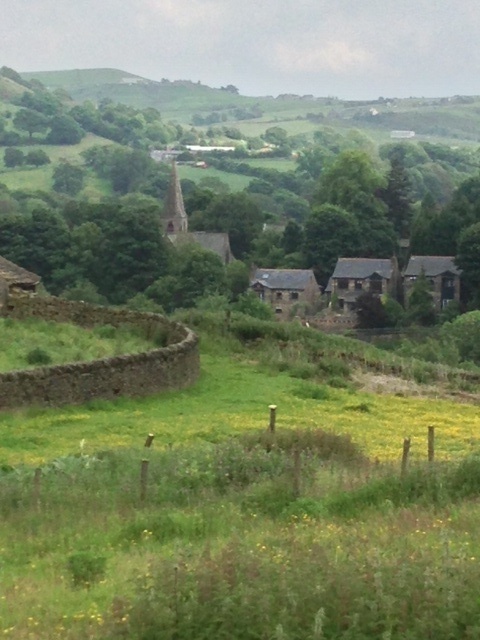 Here in Yorkshire we are never far from a small community or little cluster of houses. People wave. Stop for a chin wag, ask how we are getting on and offer advice. We stopped to check the map outside a pub in Scholes. The Boot And Shoe. Blokes came out with pints. Blokes. Reet then? What you got there? We gave our speech. We are well versed in explaining ourselves now. We tell them we are heading for Hepworth village hall and invited them to the show. More blokes gathered until we had six maybe seven curious builders taking on fluids after a busy weeks labour. Blokes. Your gonna push that from hear to Hepworth? Up these hills? We are offered a lift in the back of a van which we of course politely refuse. We had stopped initially to check the map as the pub was at a fork in the road offering two options. A debate begins between our building blokes. One way is longer but flatter. The other deeper, steeper but shorter. We gently slide off towards the right fork leaving the debate in full flow. We worked hard to get to our venue. This was a real challenge. From the top of the hill we looked down on the spire of Hepworth Church and very soon worked out that if we were going to push down before a steep lift geography suggested a bowl. We first had to slowly lower Dolly into a the canopy of trees below. Believe it or not lowering Dolly is actually more difficult that shunting her up. When pushing we can dictate our own pace but gravity has her say when lowering. This is a DEEP valley. 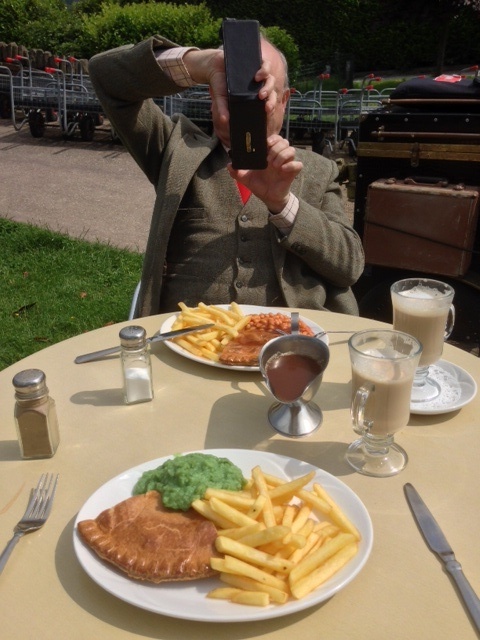 Thankfully we had fuelled up earlier with a fat plate of steak pie, chips and mushy peas. We rested at the base of the deep valley before the long slow push to the top. We had met some other building blokes on the way down who had also offered us a lift. They passed and tooted us encouragingly as we began our assent. Soon enough we arrived at the top and were tooted once more by the same van. The blokes had obviously circled around to see if we had given up and needed a lift after all. Thanks Yorkshire blokes, we had made it. The hall at Hepworth is perfect. Andy the hall manager welcomed us with tea and set up the bar. He was unsure as to the amount of audience we might gather. We dared hope for a full house. Maxim and I both agreed that if we could fill this beautiful stone hall the ingredients would be there for the perfect show. Sure enough they came. Villagers mixed with festival goers and we found ourselves pulling out extra tables and chairs moments before our curtain. The team from Blaize arrived Ellen and Paula our administrators along with Evan a filmmaker who was to capture the show for reasons of future publicity. Tacko and his showman friends arrived at 7.59 after the long drive from the south and all settled. It was indeed the perfect evening. Our show stood in front of three arched windows with a glorious backdrop of the sunlit valley behind. The hall had a bar with real ale and our audience were as hopeful as we for a grand show. Our routines worked well and everybody seemed to have a ball. We had so many welcome comments at the end of the evening I felt quite humbled. Later we met for drinks with Tacko and his showmen in the bustling festival fuelled town centre and raised a few glasses to the longest and possibly finest day of vagabonding. Earlier in the day shortly after arriving at the hall Maxim noticed a little red letter on the bar. It was addressed to me. I turned out to be a card from my wife George sending love for our anniversary. In my bed at the stroke of midnight I opened it and thought of home. It’s hard being away from loved ones a lot, especially on family occasions. Today I missed Ah Mam’s birthday celebrations and now our wedding anniversary. I also of course miss my boy Alfie, but such is life for us showmen and perfect days like today help massage the aches. Thanks Holmfirth Festival! Living the dream. I could have slept all day. A 1000ft push combined with a high energy show and four pints of Timothy Taylor’s can have that effect. My desire to remain in my pit was compounded by the fact that my bed was big and soft and the view through the windows to the valley opposite immense. My temptation to whip the duvet over my ear and snuggle in was finally overcome and after a warm shower I pulled on my vagabond uniform and made my way down for breakfast. 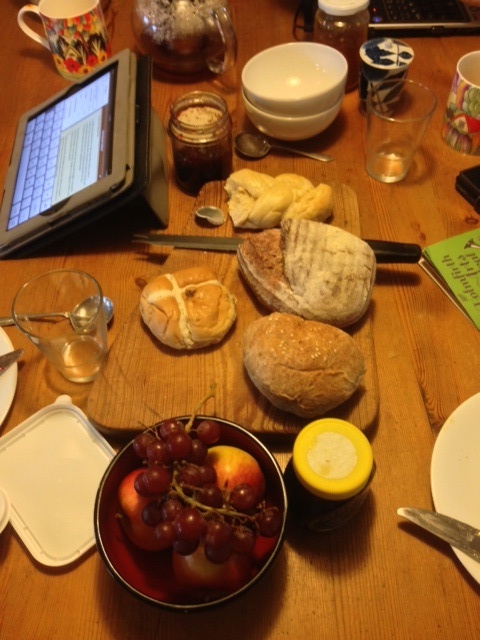 We feasted on a crusty crunchy cob with home made jams all washed down with a pot of Yorkshire tea and we shared a lovely morning thank you! Thanks you Lesley and Steve. 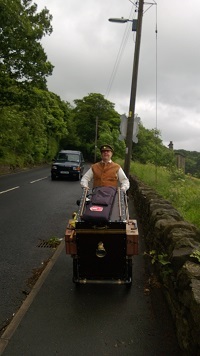 Later Steve very kindly whipped us to the top of Upperthong Lane to collector Dolly and after a coffee with the Lorain the Landlady and pub owner Eddy we waved goodbye to The Royal Oak and pushed uphill to our next gig, an afternoon show to be performed at Netherthong Primary. 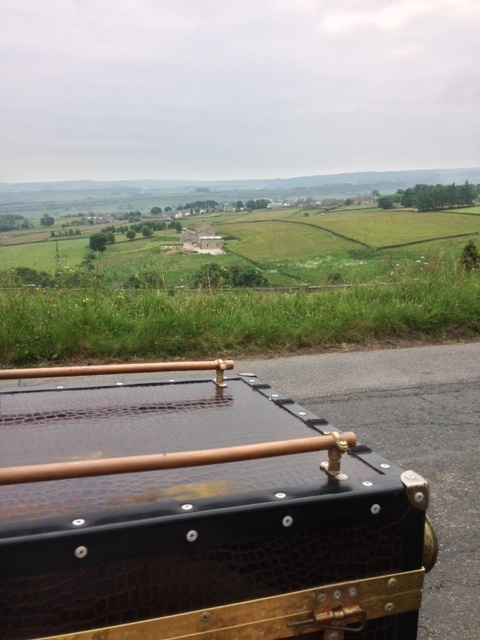 It seemed rather odd to be be pushing a long way up hill from Upperthong to a performance at Netherthong but in true Wilkinson fashion we were rewarded at the very top with spectacular views. From our vantage point a cute bench at the tip of Wolfstone Heights we looked down upon The Royal Oak last nights venue and deeper down into Holmfirth itself. We could see farmers in the distance working the land, small whips of smoke rising here and there, grandparents pushing their children around in buggies and the odd car making its way along far distant roads. The early morning rain had given way as soon as we had pushed Dolly out of the pub and it wasn’t long before we were pushing down hill singing choruses of that classic Gus Elen number If It Wasn’t For The Houses In Between. After a few miles of roller coasting roads we finally arrived at our school and were invited into the staff room for more tea and a nice sit down. Well you have to work the pies and custard off somehow. So far after nearly two weeks of vagabonding it remains unopened. Make sure to have a look at Maxims blogs if your passing. At the stroke of midday we were taken into the hall and treated to a school dinner. After having our fingernails inspected for any muck we were given home made beef burgers, chips n beans. 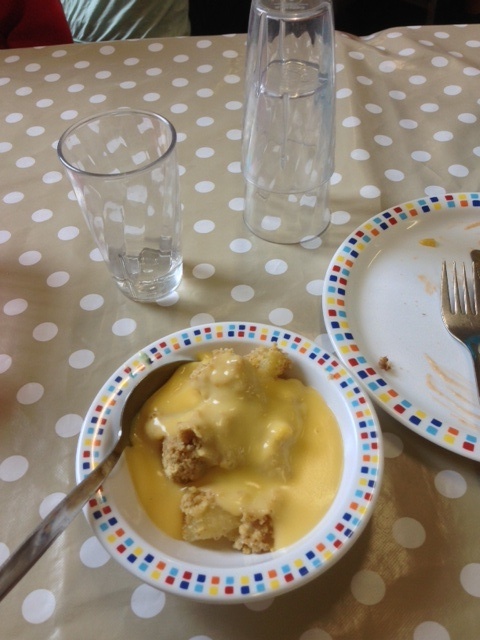 I had of course been dreaming of custard. A bowl of macaroons at Laduree in Paris would be alright and everything but as nothing compared with the apple crumble and creme anglaise and Netherthong Primary. We ate well. So well in fact that we were presented with a special badge telling us how well we had done. Barbara Cartland would be proud. After dinner our audience gathered and we performed to the children. Telling them stories and singing songs. A lovely session that extended well after the bell and into playtime. At the end of the show many hands went up attached to curious children who wanted to know more about Dolly and our adventures. The last question was “Will you come back again sometime?” Oh yes. We will work for custard!!! Incredibly the rain had lifted moments before and we pushed off making our way to Wooldale Community Centre for the evenings performance. We were given a most welcome pot of tea by a lady who had recognised us from the local paper and we sat and chatted in her garden for a short while before the final push. Arriving in the hall we set up for the show, wrote our blogs and picnicked. Perfectly on cue and once we were inside the rain began to fall. We then performed to a small but perfectly formed audience. The festival was tonight also hosting the famous comedian Mark Thomas so our event was fringe in every way. Some people later asked is it difficult to perform to small audiences. Not at all. Us Vagabonds are as happy performing to twenty people as twenty thousand, each and every audience as welcome and precious as the next. Each show deserves and receives our utmost attention and energy and as a result audience and performers shared a fine evening together. After the show we packed and left Dolly for the night and were whisked into town to watch some of the other festival events. We had a chat with Mr Thomas in the bar after his show and thankfully it went very well for him despite us steeling a few rows of his audience to our own performance. Good quality bar snacks at the central venue too! 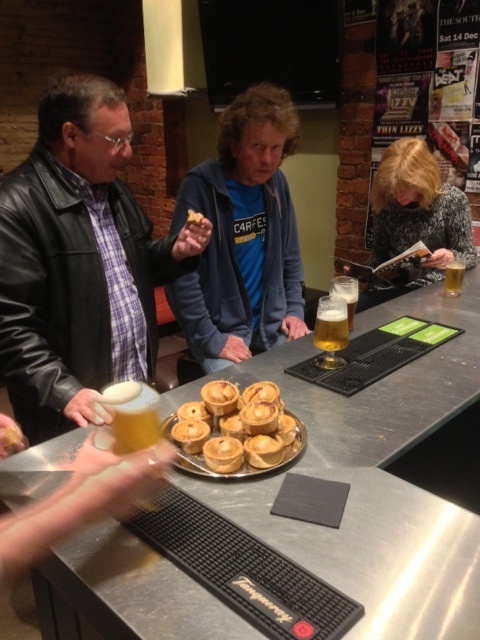 An entire platter of delicious pork pies and fine selection of beers. Holmfirth Festival know how to do it! Hon on then. One for the road. Despite countless performances at festivals and events this is our very first ever tramp outside our home county of Cumbria and what a place to start. Holmfirth is a glorious Yorkshire town which is of course the backdrop for the worlds longest running comedy program Last Of The Summer Wine. Shortly after arriving we breakfasted in Sid’s Cafe famous the world over as the starting point for the calamitous adventures for Foggy, Compo and Clegg. Taking on fluids and sausage gaps before another big push. 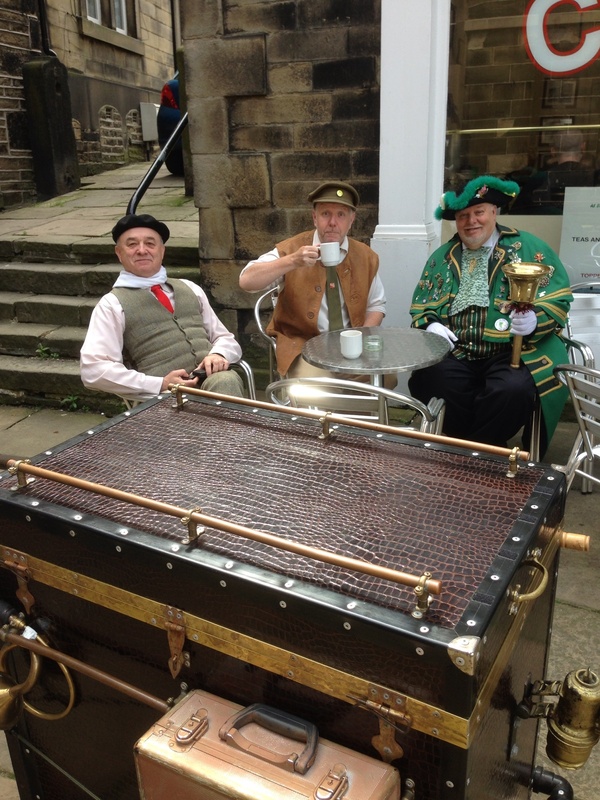 We took a press photo session to launch our week of performances and also made a short film with the town cryer to publicise this and future events for The Holmfirth Festival who are our promotors for this weeks adventures. After coffee and a fat sausage bap it was time to move onwards ….. and upwards. After our photo call we pushed our Dolly up the sharp rise that leads to the foot of Upperthong Lane. Here we were introduced to the lovely people who are very kindly hosting us for the duration of the festival. Lesley and Steve Sykes are friends of the Holmfirth Festival and have a beautiful house with sweeping views of the valley. We enjoyed coffee with them in their garden before unloading our personals and looking up the mount towards Upperthong itself. Our goal The Royal Oak a pub standing 1000ft above us and the venue for tonight’s performance. Having already conquered the mighty Irton Pike a few weeks earlier we were confident in our ability to tramp to the top and so began another shunt. 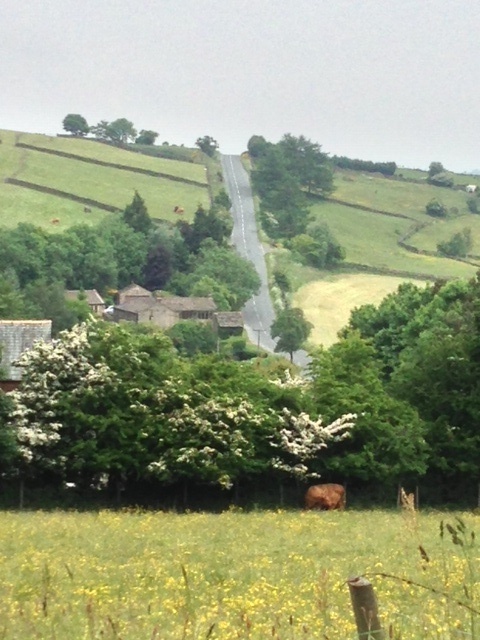 The hill was long with steep angles flanked by pretty cottages and large ex mill owners houses. Also new estate designed sympathetically to merge into the landscape. Soon enough we were joined by various school kids also trudging slowly home after a day of lessons. We have but one rule that ensures we will always make it to the top. Take your time. As long as we stop before we need to then surely we will alway prevail and eventually arrive. We stopped many times. Once outside the local church where met two blokes visiting from New Zealand who had traveled from a family holiday in Wales to visit the locations featured in The television comedy. We didn’t know but we had just walked past the resting place of Bill Owen. A fellow showman and star of the show. Later we paused for another breather and were offered cold drinks by a family arriving home from work. We drank, chatted and soon enough we were joined by neighbours all keen to know what was in our box. We handed everybody in the growing group a festival brochure, thanked our pit crew and invited them to join us at the evenings show. Arriving at The Royal Oak was a joy. A vibrant pub well supported by the locals many of which were sat in the sunshine enjoying pre dinner drinks. Our landlady Lorraine welcomed us with icy chilled lemonade and showed us around. We set our Dolly out in front of the fire and as the Royal is a wet pub were driven off to another nearby pub for a meal. What’s great pub! Can’t wait to visit again. If you do visit ask the landlady to do the trick with the maltezer. Our audience gathered and before long the pub was packed. Eventually we had standing room only. 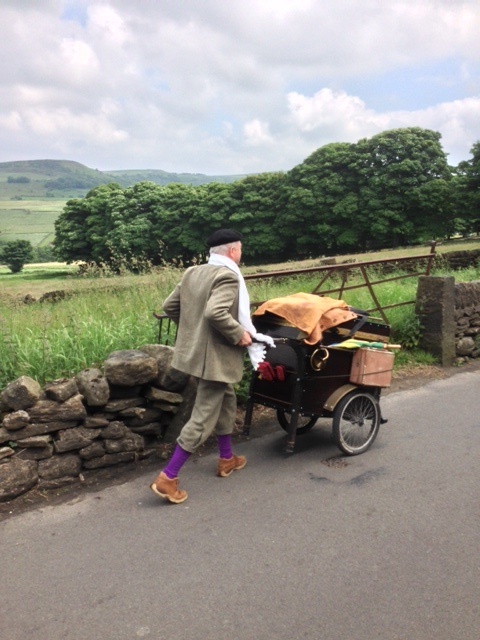 We were overjoyed that most of the people we had met on the push uphill had arrived to see the show and our audience had a lovely mix of regulars, local families, festival goers and fellow professionals who live in Yorkshire who had traveled to view. Street theatre artists, puppeteers and musicians were all present and our show was very well received. Our applause at the end rang for an overwhelmingly long time and later as we packed down we spent a good few hours in fine company with a few pints of Landlord. Two things stand out for me. One was the moment I realised I was about to display my marionette manipulation in front of one of the country’s finest puppeteers. (Who later told me I had a done a fine job Phew!) But the winning moment was shortly into the second half. A group of drinkers arrived during our interval and as they had not been present during the first set were laughing and bantering at the far end of the bar. However Maxim swiftly wooed them with one of our more intermit routines and before long you could hear a pin drop and we held the audience until the end. Three things actually. 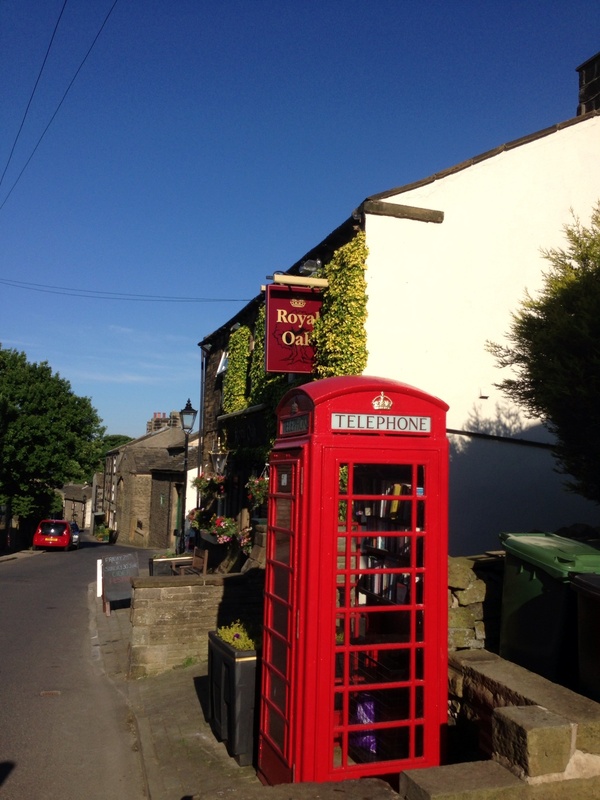 If you do find yourself in Upperthong at the Royal Oak ask the landlady to show you her trick with the maltezer. I have no caption for this. Best experienced live! Later still we were given a lift back down to our house courtesy of Smiley Smacko a local Pierrot clown and his fiancé Lounging Lynda, where I quickly fell into bed satisfied with a fine days vagabonding. This was another practically perfect day in yet more glorious sunshine. Thank you to everybody who walked a 1000ft to see our show. We left our room and made our way to the foot of Irton Pike. We paid the landlady who was hoovering the detritus from the previous evening’s party. I happened to leave my iPad on the bar as we were saying goodbye and she was kind enough to catch us up to return it even though she was weighed down with a full head of thick curlers. We breakfasted in a pleasant cafe along the street, guests of the landlord who, with forward vision, had realised he was not going to be able to face cooking it himself. A good call and we had a lovely fry up, thank you very much. We were going to need it. The pike itself is 230 meters high and we were to push our Dolly along the road that skirts the top. As I mentioned previously this was always going to be the section of the journey where we would need to drive some of the way. That said it was rather peculiar looking up at the tip of the pike knowing that we were discarding a perfectly healthy van at the bottom of it. The secret to pushing a heavy wheeled theatre up a long steep rise is pace. Always stop before you need to, have plenty of water, hope for a pub at the bottom and careful on those blind bends. We managed to make the summit with just 17 stops. Not bad at all. Nearly there. 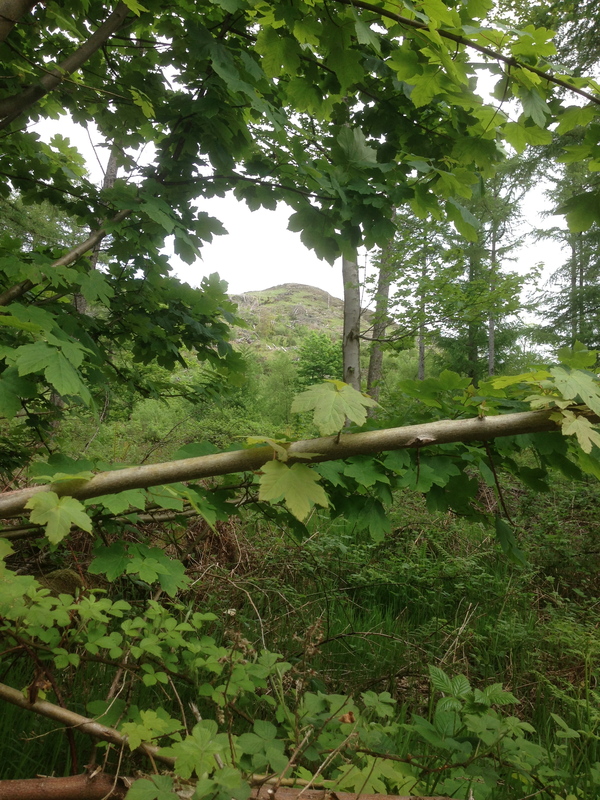 A cheeky glimpse of the summit through the trees. Along the way we were treated to stunning views of the pike itself but also the deep woodlands either side which were carpeted with bluebells and wild flowers. We also spotted something you won’t see from a passing car or probably even a whilst cycling. 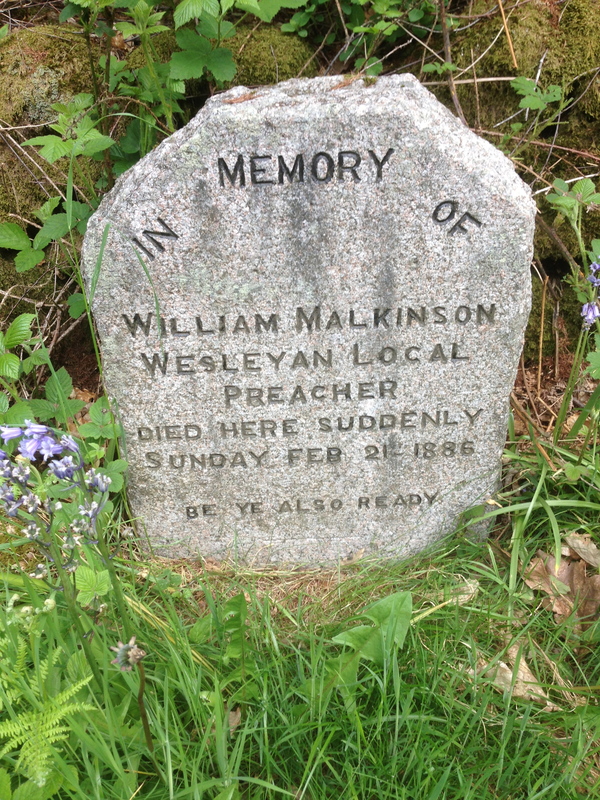 A small monument dedicated to William Malkinson a local preacher who died suddenly on this very spot February 21st 1886. We doffed our hats to a fallen fellow traveller who wandered around telling his own stories. A footnote to the stone carving said “Be Ye Also Ready”, we exercised extreme caution from there to the summit. Once there we took a moment to enjoy the stunning views of long lush valleys leading to steeper distant mountains, pikes and peaks. Then slowly down. Taking our time, proud of our achievements and in the hope of a pub and pot of tea. We were rewarded at the base with just that and having spent an hour sipping tea and blogging we pushed on to Eskdale Green and our next appointment. A ride on La’al Ratty. Ratty is a steam locamotive built in 1876 to ferry iron ore from Boot to the coast at Ravenglass. It is now run as a passenger railway and ferries tourists and local travellers along the same line. We arrived a full hour before our 2.25 departure booking and were lucky enough to check in advance with another driver heading east that our Dolly would indeed fit into her carriage reserved for wheelchair users. We gave a small performance for some fellow travellers and met with Janice who manages Headzup with me and Blez who joined us to capture some photographs for future publicity shots and archiving. 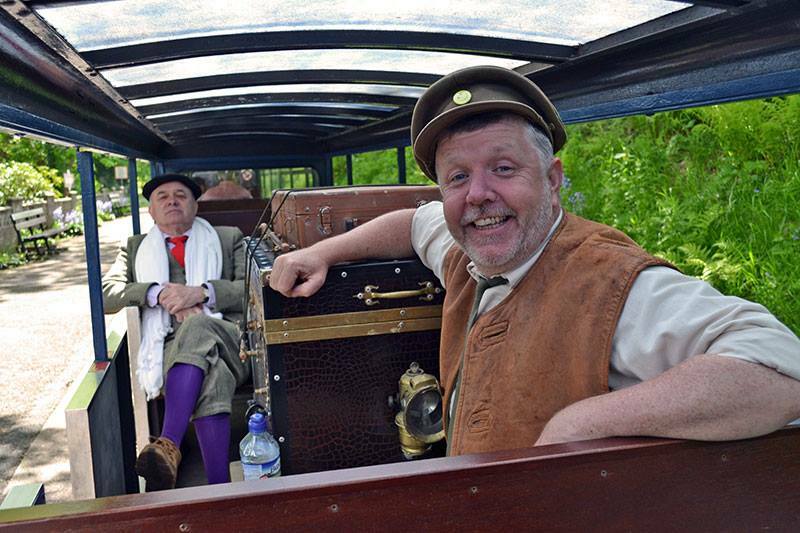 Our journey aboard Ratty lasted just half an hour or so and every inch was a joy. 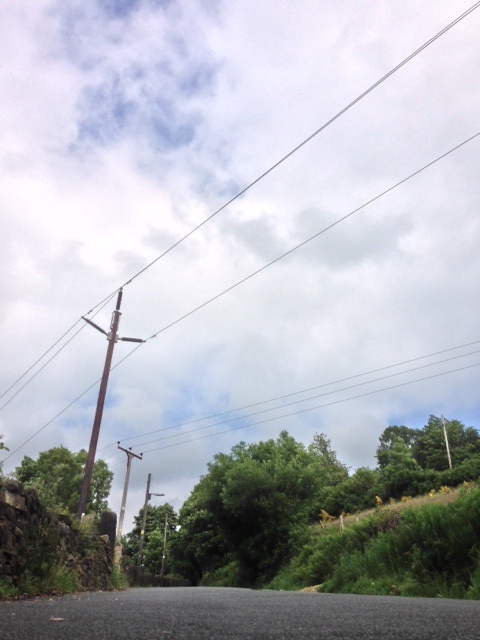 The countryside unrolled before us through the steam. The weeks and weeks of rain recently endured has caused the grass to explode into the deepest green and created an abundance of wild flowers of every colour. I doubt the county could ever again look as fine. We detrained at Ravenglass and thanked our driver and guards before pushing on to our venue, a pretty hall on the promenade of the estuary. The local committee presented us with a lovely picnic and we feasted on butties, home made scones and cakes with Janice and Blez. Later our families arrived, Maxim’s wife Rosie, then George, Alfie, Ah Mam and our friend Boomdang T.
Later still other people joined us for the show. Local folk but also a few people who had received messages from friends who had seen our show previously. Our performance went well. The begging of the second half stood out for me. In this segment we invite audience members to join us for a Mummers play. We had a particularly spirited group that evening featuring actual Mummers, a story teller and percussionist. Our show ended as the sun began to set over the estuary through the hall windows and all to soon we were saying goodbye and packing the van at the end of the Cumbrian leg of our journey. This is not the first time I have Vagabonded Cumbria and I already know it won’t be my last. A picture from our photo shoot in Ravenglass caaptured by Shaun (Blez) Blezard. Thank you to our venues, our promoters and of course audiences. Thank you to everybody who tooted, waved and slowed down for us as we wandered West Cumbria. Finally a massive thank you to Bob and Caroline from Arts Out West. 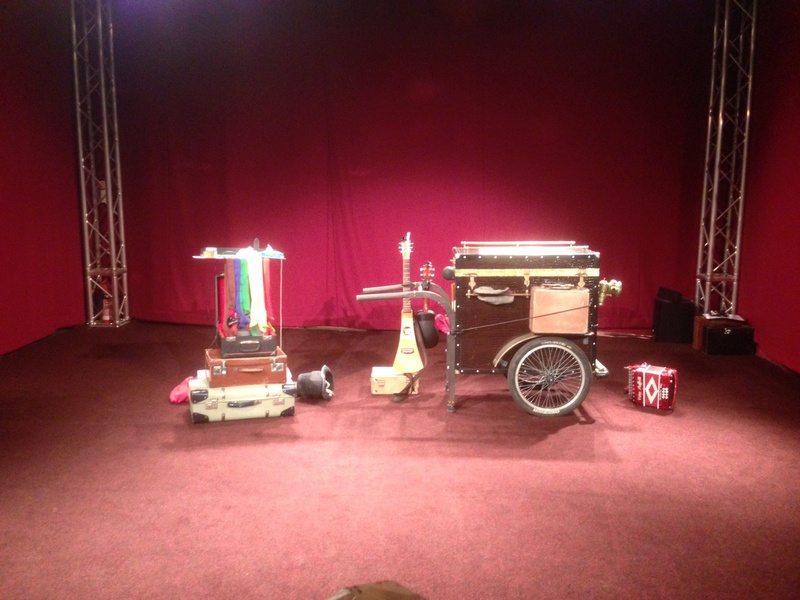 Maxim and myself will next travel Yorkshire as performing for Holnfirth Festival. Come and join us at a gig if you can or please pass news onto your friends if they live local. After breakfast with Jenny and Malcombe we pushed along for Haile. This is a pretty village probably a short three mile shunt. A couple from the previous nights audience stopped to wish us well and offer directions. We gathered on a narrow road and a backlog of cars soon began collected behind them. Shortly more gathered on the opposite side locking the road. This being Cumbria nobody seemed to mind the delay and all waited patiently then waved as we made our right turn and eased the congestion. 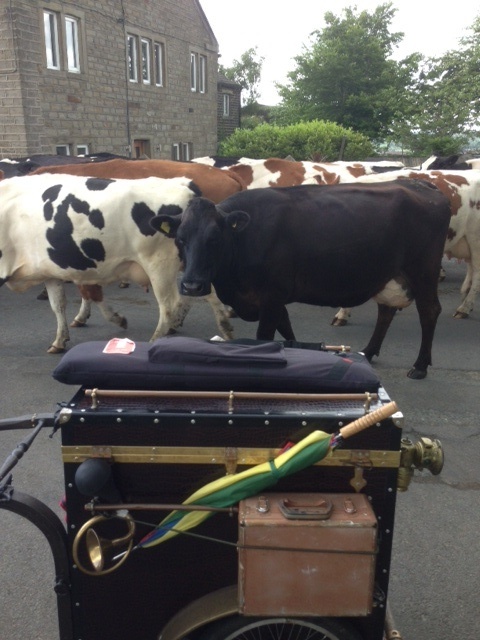 Outside the pretty village hall in Haile we set up our street theatre show. We have two shows with us. One is our Story of Stories we show this in village hall venues, our second collection of stories we perform by the side of the road to passing punters. News of our arrival sped quickly around the village and soon enough we had 15 people sat on a beautiful patch of grass behind the hall. Our audience ages rained from six to ninety years old and our show went very well indeed. So well in fact that half our audiences were to follow and join us later for our performance in Calder Bridge. A lovely walk followed and the entire shunt we were bathed in glorious sunshine. The journey was void of a single car. Dolly has recently developed a noise. Sure enough Maxim noticed a buckle in her right wheel. Further inspection revealed a loose nut holding the wheel in place. A few twists and we were back on the road. Aside from two flat tires and a cracked handle taken during another Headzup tour this is the first time I have had to look under the bonnet. Testament to the incredible talent of Dolly’s creator the artist Luke Burges. 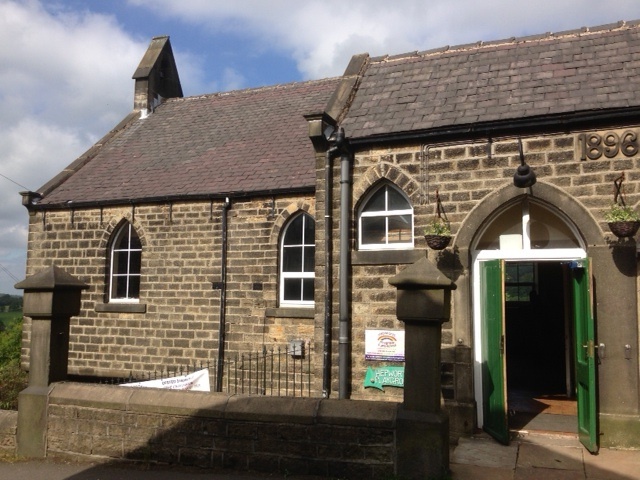 The hall in Calder Bridge is huge compared to previous venues. We met with our promotor Yvonne and her family as we blogged outside the local pub enjoying a tall chilled lemonade. Later they took us back to their house for a meal. They were celebrating the first anniversary of buying local pub the Golden Fleece and are looking forward to the monumental task of renovating the entire building themselves. The highlight of the tour for me was when we were shown into the pig cellar where in the past animals were bled to make black pudding. I don’t believe I have ever been a guest in a home that boast a black pudding room. Later the committee gathered en masse to transform the hall into a theatre and our audience arrived. We gave our performance to a full house and our show was much appreciated by all. I was even lucky enough to win a prize in the raffle. Sadly I lost out on the whiskey and wine but I did bag myself a box of well scented draw liners. Lucky for me as it is soon to be Maxims 62nd birthday and as yet I had been unable to find a suitable present on the road. Happy birthday Maxim. You are now be the proud owner of scented draws. Invaluable to a vagabond bloke. Hope you enjoy the scented draws. We were always to travel in the van for a short while during this journey, our map reading suggested that the A595 is far too treacherous for those of us pushing of traveling theatres. Locals also advised us against this and so it was that after our show we loaded Dolly into the van and drove the short distance to Gosforth and spent the night in a wild pub. If your ever passing Gosforth and want to enjoy at least one local boozer that is thriving have a look for The Lamb and Lion. Great beer, strong whiskey and grand banter. A thriving pub that thrives well into the night. We breakfast in the shadow of Irton Pike, where we will face our biggest challenge, a long drag to the top and Dolly’s steepest altitude to date. 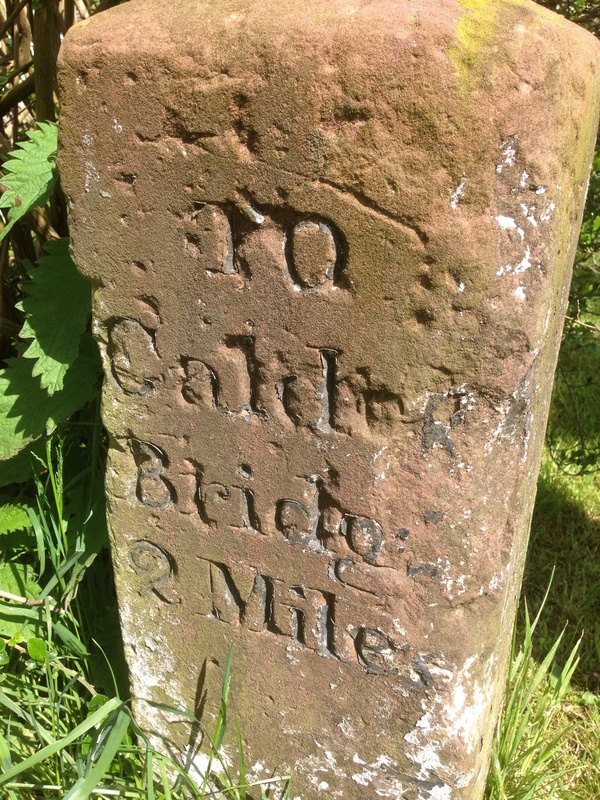 Not long to Calder Bridge now! Fingers crossed we will overcome this monster and take Ratty to our final Cumbrian performance in Ravenglass. Thanks Calder Bridge. another excellent day. Last night I found myself in the back of a car driven by a bloke called David who alongside Hans Blix works for the United Nations as a nuclear inspector. He was there when they didn’t find anything. I was sat in the back of his motor eating pasta off a china plate with some lovely olive bread that I had been given at the close of our show. David (One of our audience members) very kindly drove us to St Bees where we were to spend the night. Along the way we we discussed wether or not the wind turbine viewed from the right hand window was a blot on the landscape or not. Curiously if I looked out of the left window we were in the shadow of Sellafield Nuclear reprocessing plant. We had just performed our premier at a beautiful and intimate theatre called The Florence Mine near Egremont. 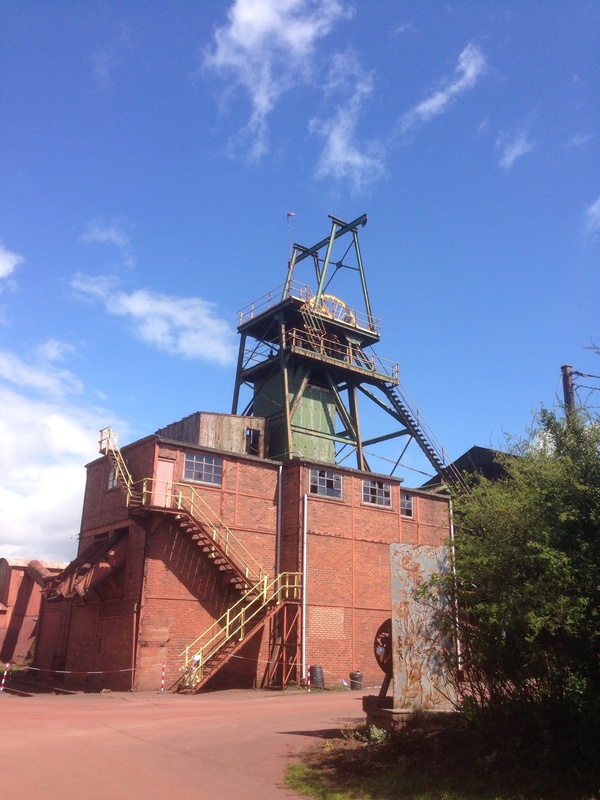 This ex iron ore mine now boasts a thriving community of artists all gathered in various workshop spaces. They have a gallery, a coffee shop, a bar and theatre space. Our audience gathered around small tables cabaret style, or relaxed at the back of the orchestra stalls on comfortable sofas near the bar. Congratulations to Peter the manager and all his team who have created a vibrant Phoenix from the red dust and residue of a now lost industry. And so to our first night. As a showman I am at my happiest performing to audiences when offering something new. There is a glorious mix of excitement and fear involved in premiering a new show. Audiences and artist all to soon gauge the measure of each other and both swiftly realise what kind of evening we are each heading for. A new show can go either way. Our opening night. Florence. Mine Egremont. We hope that each routine will entertain in its own right but also that our collection of stories knit together seamlessly into one long tapestry of tails. We hope our audience are in the right mood. We hope our audience feature the perfect balance of ages and characters. We have a lot of hope. As time passes and our shows evolve us story tellers naturally alter the pace of our delivery and we will constantly tweak and fiddle with a show from our opening night until our final curtain. And that first night when you stand in front of an expectant paying audience you can only hope your show is good. You never actually know this to be the truth until your on stage. Thankfully at our premier in the Florence mine both Maxim, myself and audience were quickly able to relax. Surely enough a quarter of a way into our first show I enjoyed that familiar tingle that tells me it’s OK and our audience are engaged. Thankfully each routine worked as we had hoped and our palate of songs, stories and routines worked well together as one whole. Later at the bar our audience shared with us there favourite bits and thankfully again most of our routines earned a mention. Earlier we had our first shunt. Five miles of glorious Cumbrian scenery. Up hills, along pretty avenues with lush green canopies then up hills again. We had lunch at the side of the pretty church in Haile which was opposite a large hill entirely washed with blue bells and wild flowers. We passed babbling rivers atop ancient stone bridges. Cumbria is indeed a beautiful and hilly part of the world. Our first push covered five miles in glorious sunshine. Along the way Maxim enjoyed his share of puffing and panting up the big hills as much as the gentle strolling along the flat lush lanes. After a few miles we had done away with the politeness of asking whether each would care for a break from shoving and had sunk into just knowing when to stop or handover. The secret to pushing a heavy load a long way is stop and rest before you need to. An easy enough job when you are lucky enough to tramp through glorious Cumbria, always encouraged by what delights might await our viewing at the top. Finally down hill and into the mine complex itself, a well earned coffee, meat pie and first fit up. Inside we met with local artists Jenni and Marie who specialise in making paints both oil and pastel from ore cut in the mine. This delivers a wonderful sandstone red hue and exhibits of work using these bespoke materials were hung proudly in the venue by myriads of artists both local and national. During one of our routines I use pastels to illustrate one of Maxim’s stories. I know proudly use a pot of Egremont Red hematite to colour and shade with great effect. So a grand long walk, glorious weather, beautiful landscape and a successful premier. Interesting and kind people plus a few pints of Buttcombe and the promise of a fry up in the morning. All in all a perfect start. We are truly on the road. Beckermet reading rooms tonight. We have five more miles to shunt and the weather is again lovely. All I need to do now is return the plate. Our dress rehearsal is done, dusted and after many weeks of plotting, writing, researching, rehearsing, ripping it up and re-doing at last our humble Vagabond show is finally ready for viewing. I will leave our Director Jim Woodland to cover the overall philosophy of our show via his blog below. Suffice to say we have had a wild time creating the show and I have enjoyed the creative process very much. Our test audience seemed to enjoy our show and many offered advice on where it might be tweaked. 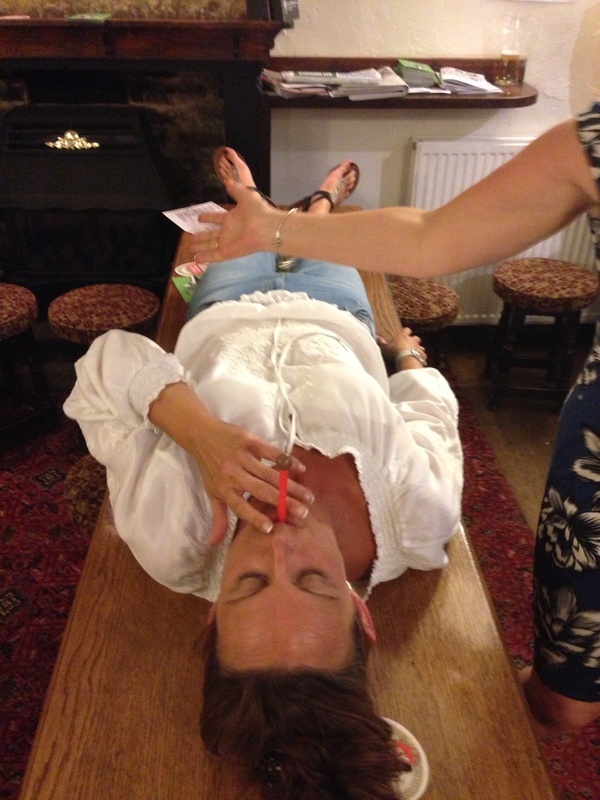 Thank you to the good people of Bowes for offering themselves as guinea pigs. There is no better way to gauge and massage your show than reciving honesty from your last audience. That said thanks to our friend and director Jim, who has guided and encouraged us over the last few weeks. Each round of applause that we lucky enough to collect along the way we share with you. That and any vegetables, half house bricks or paving slabs we might encourage. Well we spent recent weeks getting the long awaited new travelling show on its feet. It’s been a year in the preparation, from original mapping sessions to final script. Several new songs by Gary Bridgens’ and a collection of stories and sketches either written or collected by the company which in this case is Mike Bettison. An interesting brief this one. The Story Of Stories! My job as director was to help make this eclectic array of tales into a coherent show of some kind. I mean it has the word story twice in the title which is a bit of a giveaway as to what was needed which is best summed up as a beginning a middle and an end. The material available did some of the job for us covering the period from prehistoric cave paintings to the Internet and social networking. At least it was in the right order chronologically, but it also needed to work as a story in its own right. And it emerged during rehearsals that the best story to act as a vehicle for all the other stories, would be a potted history of performance itself. Interestingly the nearest we got to literature was the cave paintings and from that point on we stayed with the oral tradition, having fun with Inuit songs (No really! ), Viking sagas, Music Hall, Radio and Rap. Gary and Mike needed no encouragement to get going on this one. In fact much of my job was to stop them from getting going and constantly adding new bits. The stories themselves came together with a little bit of kindness and an immense amount of cruelty, but it was the links between them that often got us giggling. Two blokes on the stage telling a story? We looked for inspiration and quickly found ourselves in the company of the likes of Morecambe and Wise, Laurel and Hardy, the Two Ronnies, Smith and Jones, and Captain Mannering plus whoever you want to put him with. So there you are. If you want an idea of what the show is like, it’s a mixture of street, music hall and rap. I suspect that if you had walked into the rehearsal room unannounced at any point during the rehearsals you would either have been extremely impressed by the range of talent on display or you would have been extremely irritated by the amount of irreverent and noisy banter from three blokes of a certain age (Gary is younger than the other two to be fair!) spending much of the day rolling around on the floor in helpless merriment. Well, pop three seasoned anarchists in a room and ask them to tell you a story and what do you get? The Story of Stories. Dress rehearsal tomorrow. I can’t wait to see it how it all ends…. It has been two years since Headzup delivered our first peripatetic story telling adventure. 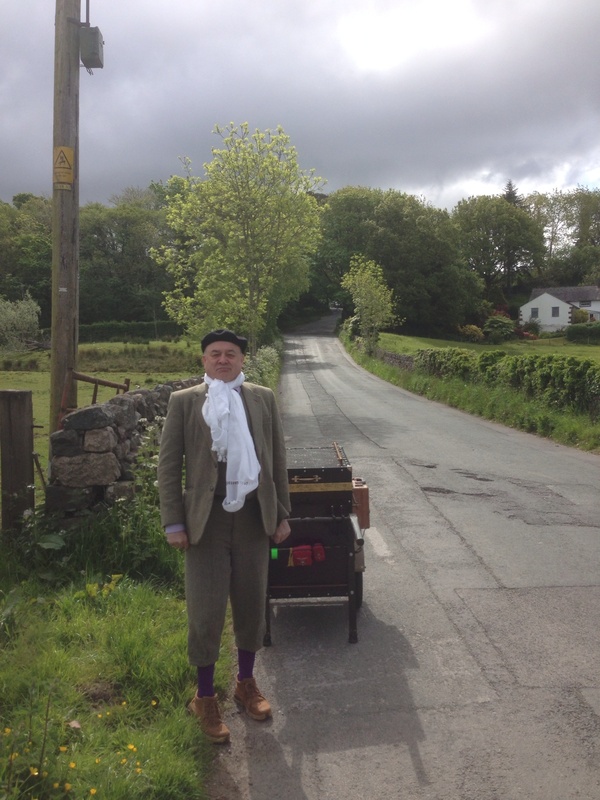 In fact I write this blog on the second anniversary of our performance in Sparkbridge an idilic village in South Cumbria. That night we were to perform on a beautiful lush patch of grass by the gently flowing river. However the weather had taken a turn for the worst and as a result we were invited to take shelter and perform in The Royal Oak as guests of the landlady. The show went very well indeed despite the shallow ceiling, so shallow in fact that we had to drop our marionette routine from the set. A shame really because after the show a man approached us who had been in the audience and asked if we would like to view his collection of puppets. He then brought in a car load of antique marionettes that had been built and operated by a double act performed by his dearly departed Aunts. The puppets were quite amazing. The attention to detail was stunning. There were characters from all over the world clad in elaborate hand stitched costumes. There were exotic animals, lions, bears and more familiar creatures cows, sheep and birds. Human figures too. Kings, Queens, soldiers and children. Young old, rich and poor. So many characters that his ancestors would surely have been able to perform any story imaginable. Perhaps being local they might have performed in that very pub in some distant past. The puppets were each individually bagged and catalogued and after a lengthy inspection the inheritor asked if I would like them. Anybody who has witnessed my marionette manipulation skills will be relieved to learn that I thanked him politely and suggested that he would be best finding a true scholar of historic puppetry and have them displayed in a museum. Still this was an amazing offer. Also that night we were gifted a meal and copious amounts of beer from our landlady. 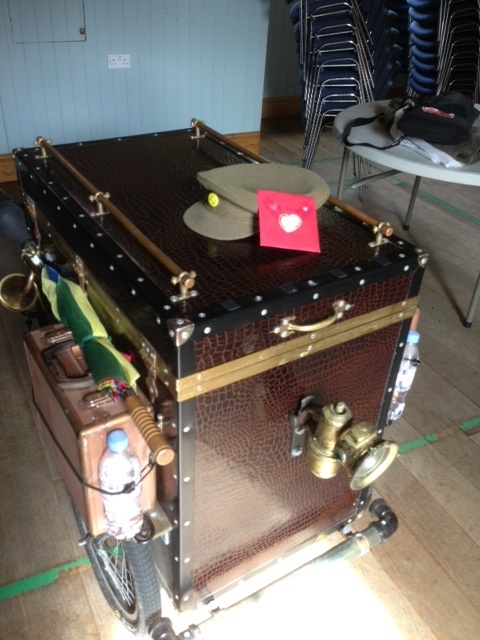 We enjoyed whisky courtesy of our audience and a full hat of coins from our collection. At last orders we were even given the keys to the village hall on account of the bad weather and we were free to bed down for the night and shower in the morning. This reminds me of the incredible generosity and sense of value we received everywhere as myself Lord Gregg and Dolly tramped and performed during that first walking project. Our show Vagabonding lasted for three weeks and in that time we covered over 120 miles largely on foot performing in a myriad of locations. 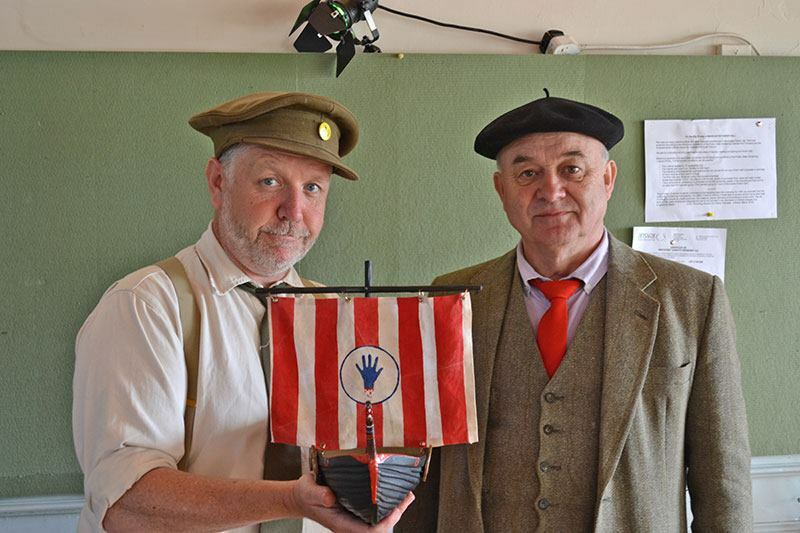 We delivered our show on village greens, in pubs, on railway stations, in pubs, in village halls, schools and well … pubs. It was a rather wet that particular May. Our show was commissioned by Lakes Alive the company famous for delivering an outstanding three year project of outdoor work in Cumbira as part of the cultural Olympiad. The show featured a collection of Cumbrian stories. We explored the history of Piel Island, how it was invaded by Lambert Simnal and his army during the 1600’s. We told how the town of Dalton was ravaged by a wicked medicine pedlar by the name of Doc Lancaster, a man who sold poison to the locals claiming that it was in fact a cure for the plague. Another Dalton story talked of Commando the pigeon who was awarded the coveted Dikin medal for assisting british secret agents by flying home with warnings of nazi military tactics. From our home town in Barrow we told of two lovers who would meet for lunch on the very tips of two cranes that they operated in the shipyard during in the second world war and how they eventually married and grew old together. Two years later we are to embark on a second journey. Dolly and myself will this time be joined by Mike Betson of Blaize a theatre company based in North Yorkshire. Blaize deliver all manner of projects working in both rural and urban locations. They make films, burn spectacular bonfires and tour village halls with finely crafted plays telling stories in the most remote venues. We are directed by the celebrated playwright and songwriter Jim Woodland. Mike and Jim were two members of The Fabulous Salami Brothers, probably the finest street theatre and festival act of their generation. I recon this is as close as ill get. Ill talk more about the content of this show as it develops. We are entering our last week of devising and rehearsing and this new collection of songs, stories will soon be ready to show. Dolly our cart is oiled and ready to be shoved and shunted into whatever kindness or catastrophe awaits us on this next Vagabond adventure. The new Headzup website has been designed by the visionary web wizard and sound artist Shaun Blezard. He and the ever excellent co director of Headzup Janice Benson will be steering us and keeping a watchful eye from the Dalton command centre. The first leg of our journey takes place in venus promoted by Arts Out West in Cumbria. Later we will tour Yorkshire for the Holmfirth Festival and then Lancashire for Spot On. The dates and venues for Cumbria are below. Please come along, pass it on or just follow the blogs as we Ramble On. Hopefully no hospitals this time.